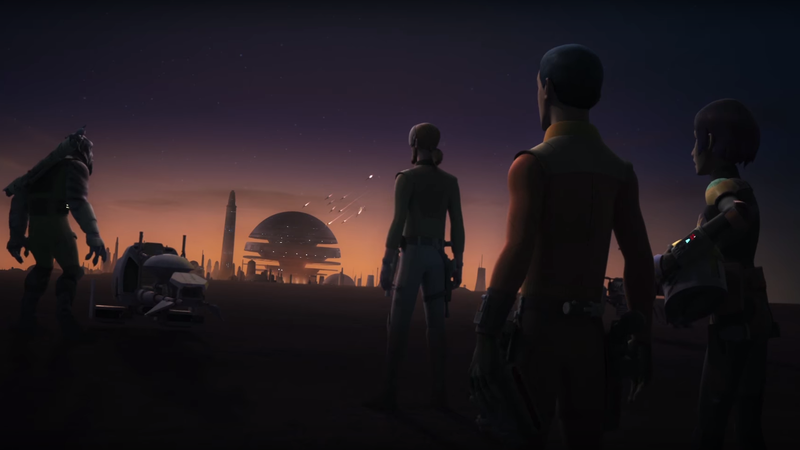 It’s a banner day for Rebels fans: the second trailer for the final season of the Star Wars series has been released. And things are beginning to look pretty final for the crew of the Ghost. There’s a lot going on in this trailer, but it all works to position our heroes at the crossroads. Ezra (Taylor Gray) is questioning whether or not he’s fighting the Empire in the right way. Kanan (Freddie Prinze, Jr.)is doubting himself and questioning the future of his relationship with Hera (Vanessa Marshall). Meanwhile, the words of Saw Guerrerra (Forest Whitaker) insist that the Rebel Alliance is not the only way to stand up to the Empire, and implores an unknown listener (the crew of the Ghost, presumably?) to stop “running Mon Mothma’s errands.” The entire situation seems dire, and the events of Rogue One suddenly seem very near. Tying it all together are the words of Kanan and a glimpse of wolves from Lothal, implying a vision from the Force and connecting to wolf imagery that series head honcho Dave Filoni has previously used to tease the season and the possible return of fan-favorite (and my favorite) Ahsoka Tano. We’ll start finding out on October 16th, when the final season of Star Wars Rebels premieres. You can watch the trailer below.